No matter what size of greenhouse you have, the important thing is to make the most of it. You want a greenhouse that can match your requirements exactly and this is where the Eden accessory range can help. 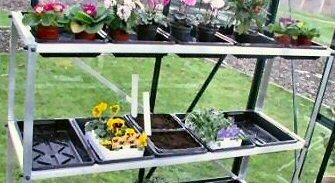 By introducing shelving and staging into your greenhouse you will be surprised at just how many plants even the smallest greenhouse can accommodate.